How to paint eggs using oils. OK, how to paint eggs! You've found my demonstration on painting this simple but difficult subject. 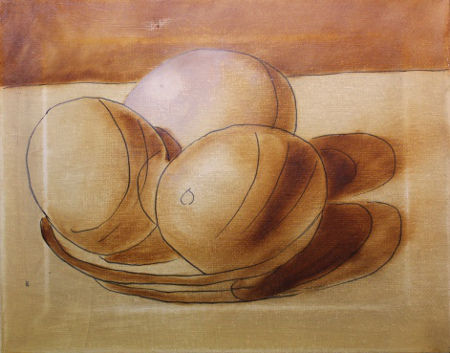 This is a two part demonstration to paint eggs, and the first part is below. Now, you may notice that there are slight differences in each of the photo's as far as size and shape of all the elements. That's because this isn't my normal progression of a single painting and the layers going into it's creation, but rather, this is a demonstration I put together for my local art club. It is actually four separate paintings showing the process I used. I'm going to show you too, some of the flaws that developed in how I painted these. 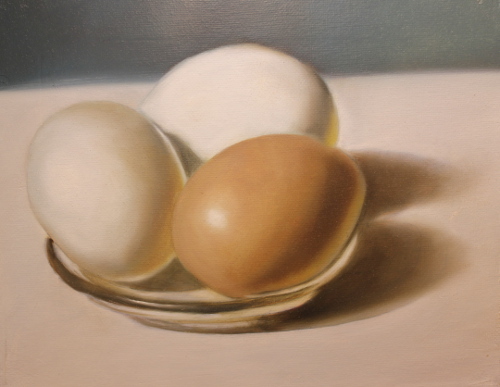 Hopefully, this will help you when you paint eggs in your next small still life. What is the main purpose in doing eggs? To show you the very gradual shadow and round form that can be achieved with multiple layers of oil paint. Very few mediums can achieve such a smooth transition, and to prove it's not just an accident, it's done three times, on 4 separate paintings! In order for the members to see this better I used a thicker pen to draw the outline of the subject matter. In this first photo, canvas toning, pencil drawing then ink drawing has been completed. 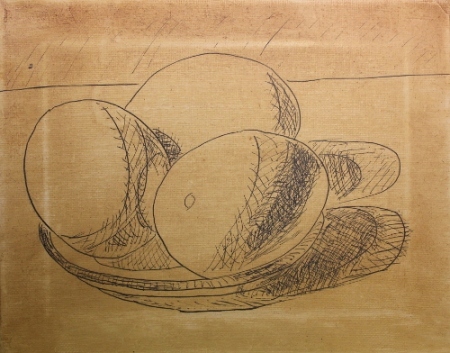 Cross hatching in the ink drawing is rather heavy and the drawing is simplified. In this 2nd photo, we have the brown underlayer completed. In the top egg, I've added white to show an additional step that can be taken in this layer. This was just to show an area that I wanted to be super bright in the final layer. You can see also the shadow and form being developed on each egg. Applying the umber, blending, and softening with the mop brush gets you there. Always be thinking about that next layer when working a particular layer. 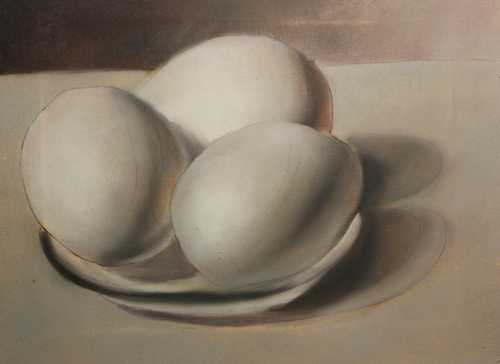 One thing I think I will remember in future paintings, the cast shadow for these eggs. On the far right, the bold ink line where the shadow actually is beginning to fade is going to cause me problems. I should have used a cross hatching rather than a solid line to show this fading shadow. You will also notice a shadow of white around the border of the painting about an inch into the canvas. This is caused by applying to much pressure when using the razor to remove dust and excess paint. By lightly spraying the back with a bit of water/rubbing alcohol mixture, the canvas will get tight again, and help in preventing this. This next photo is of the gray layer. So lets talk some about this part of the painting. My light shadow around the edges has been eliminated almost. Also, the cast shadow on the right side is still showing my bold ink drawing. I knew this was going to give me a problem. Notice the right side of each egg. I've left quite a bit of brown under painting showing through. This will represent the soft secondary light glow from the right that I usually have on some of my still life paintings. Click here to see part II in how to paint eggs in oils.